What Type of Oil Does a Yard Machine Lawn Mower Use? Yard Machine is a popular brand of both push and riding lawn mowers with a cutting radius of 20 inches to 42 inches. These are considered "small motors." They require oil for the same reason your car does – to keep moving parts lubricated and to protect the life of your investment. 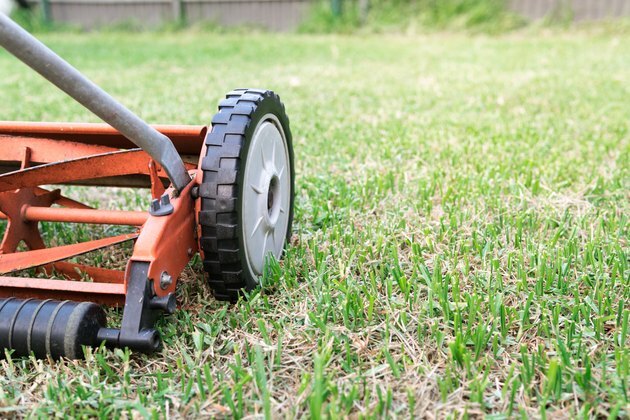 With several engine sizes to consider, the oil cylinder capacity will vary per model, so you should consult the mower's owner's manual for specifics. Yard Machine engines are manufactured by Briggs & Stratton, which powers many respected mower brands. Briggs & Stratton recently amended its warranty coverage to stipulate that synthetic oil is now considered warranty-compliant. Synthetic oil has been engineered to resist heat better, slowing down its degradation and giving what some feel is better protection for your engine. This is good news for people who live in regions where the climate has a wide variety of temperatures throughout the four seasons, as synthetic oil is ideal for all temperatures. Oil comes in different weights meant for operating in different seasonal temperatures. SAE 5W30 is intended for 40 degrees Fahrenheit down to -30 degrees Fahrenheit, so it's unlikely you'll be mowing the lawn much in those temperatures. A synthetic SAE 5W30, though, offers the coverage for varying climates, working well anywhere from 100 degrees Fahrenheit all the way down to -40 degrees. If you live somewhere with a warm climate, SAE 30 is designed for 40 degrees Fahrenheit through to 100 degrees. The SAE 10W30 works anywhere from zero degrees Fahrenheit to 100 degrees, but it gets consumed faster when used in temps over 80 degrees Fahrenheit, so keep an eye on levels during the summer. For the best bet, get a 10W30 or a synthetic 5W30 for all-season coverage. Do not use oil additives for your Yard Machine oil. These are unneeded and can, in fact, void your warranty coverage. Finally, ensure the oil is marked as "For Service Class SF, SG, SH" or higher. These indicate engine manufacture years. Anything below SF (SE, SD, and so on) is for an engine far older than you likely have. The Petroleum Quality Institute of America has "current" motors listed as needing SJ, SL, SM, SN oils for machines made after 1996. Oil quantity depends on the kind of mower in use. For a push or walk-behind mower, you're likely going to use 15 to 18 ounces. The mower's owner's manual will give you an exact amount. The suggested maintenance for this size engine is that the oil be changed out after 50 hours of mower use, or at least annually – whichever comes first. A riding mower has a larger engine obviously, therefore using more oil, generally between 48 and 64 ounces. These motors have recommended maintenance of doing oil changes every 100 hours of use, or annually. Either way, the machine will have a dipstick for the oil cylinder. Use a rag to clean off the oil dipstick before dipping it back in the cannister to check the oil level. Although it's not necessary to operate the machine at "full," be sure you're somewhere between the "minimum" and "full" lines marked on the dipstick. When you overfill the oil, a few things can go wrong. If you're lucky, it's just a little excess and it'll burn off while the engine heats, causing the engine to produce white smoke. This should settle down. But other problems can cause more grief – all solvable but still worth avoiding by filling the canister cautiously. One issue can be the spark plugs fouling. If oil gets on these, they won't spark and the engine won't start. Plugs can be cleaned or replaced. Another problem can be oil getting on the filter, which can clog it and starve the engine for air, resulting in the engine failing to start or sputtering and dying. The filter can also be cleaned or replaced.